60cm boosted induction cooktop is rated 4.6 out of 5 by 8. 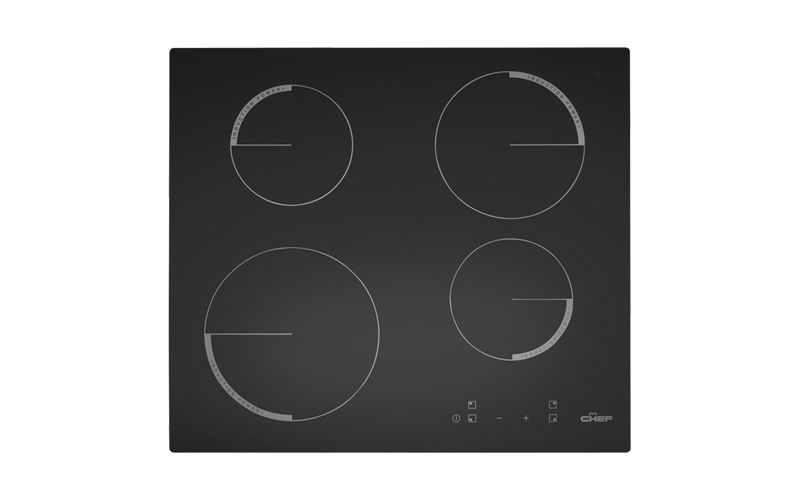 60cm 4 zone boosted induction cooktop with touch controls, residual heat indicator, automatic pot sensing and 9 heat settings. Induction combines the speed of gas with the additional precise control which induction is known for. A range of cooking zones allow the cook to prepare almost any sized meal, at a consistently high quality, faster and easier. No naked flames or elements means there is less heat in the kitchen. Rated 4 out of 5 by jimrobson183 from Great Features I bought this appliance a couple of months ago and haven't had any problems with it. I only have a couple of points to make: 1. I would rather like a sliding scale of temperature-control instead of having to press the "-" & "+" as the constant pressing is not very effective, and 2. If I keep the power on at the wall-switch the chances of accidentally turning on the appliance are high if something comes in contact with the onscreen power switch. Other than these 2 points it is an excellent appliance. Rated 5 out of 5 by Rob H from Great looks and features. I bought the Chef cooktop in December 2017 and immediately fell in love with it. It’s safe, very responsive and it looks great. Rated 5 out of 5 by Rhondy from Great appliance induction cooking made so easy I with the help of appliances on line I bought my Chef induction cooktop. It makes cooking so quick, is reliable. I have had previous induction cooktops however this one outranks them all. So much easier to use no complicated instructions. Would recommend this product as reliable easy to use and looks great on my bench top. This appliance is as it is shown on the Appliances on Line website. Rated 5 out of 5 by Kathy22 from Great safety features We selected this cooktop when renovating our kitchen. It looks great, heats extremely quickly and has some great safety features. You can't turn anything on by accident, you get an alert when a pan is removed and the hotplate is still on. There is a warning light while the hotplate cools. Easy to use and keep clean. Rated 5 out of 5 by Sunnytop from Top Chef My new induction cook top is great. Cannot believe how quickly the heat arrives and then cools down. Looks fabulous. Easy to clean. Easy to follow instructions. Great price from Harvey Norman. Took a little while to get used to - but I love it. I would high recommend this product. Rated 5 out of 5 by Tracy64 from Great Cooktop This is my first experience with Induction cooking and I’m glad I decided to choose Induction and very glad I picked the Chef cooktop! Rated 4 out of 5 by Pollie 3772 from k Delighted with this cooktop, spacious cooking area, and easy to understand controls. Cleaning quick, and easy, great appliance.